More ‘surprises’ seem to be in order for Sri Lanka’s corporate sector, with the latest coming in the form of further amendments to an already battered and bruised tax regime. In mid September, the Cabinet approved the proposed amendments to the Value Added Tax (VAT) Bill, which would raise the VAT rate to 15 percent – this will affect telecom services, tobacco, air ticket fees and selected private medical services. At the same time, the VAT threshold on retail and wholesale trade was increased to a value exceeding Rs. 50 million a year – whereas, according to the previous draft bill, this threshold was to be reduced to three million rupees a quarter. In July, the Supreme Court issued an interim order preventing the Government from implementing the four percent VAT rate hike, until the consent of the Cabinet and Parliament was obtained. The results of the latest LMD-Nielsen Business Confidence Index (BCI) survey, however, seem to paint a more positive picture – although this could have more to do with the timing of the VAT announcement vis-à-vis the survey period (i.e. first week in September), reasserting the volatility in corporate sentiment that can be created on account of ad hoc policy measures. THE INDEX For the second consecutive month, the BCI has moved in a northerly direction, to reach 150 in September. During this time, the index has gained as many as 24 basis points, to surpass its average for the last 12 months (146) and edge up towards the 158 mark recorded in October last year, following the formation of the National Unity Government. THE ECONOMY Businesspeople appear to be more optimistic about Sri Lanka’s economic prospects than in the recent past, with nearly four-in-10 respondents asserting that the economy ‘will improve’ in the next 12 months, while a similar number expect conditions to ‘stay the same’ and 21 percent hold a negative outlook. 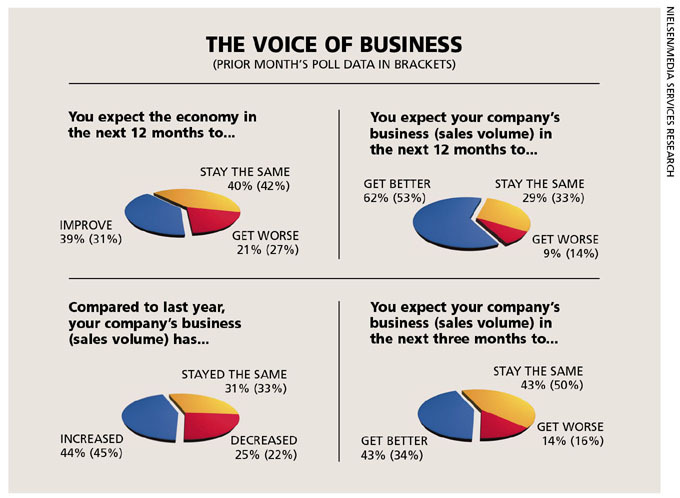 BIZ PROSPECTS Sixty-two percent (versus 53%, in the prior month) of those polled say their companies’ business will improve in the next 12 months. Notably, less than 10 percent of the survey sample expect sales volumes to deteriorate over this period, whereas almost three-in-10 foresee the status quo being maintained. Over the near term – i.e. the next three months – 43 percent of poll respondents anticipate that their business volumes ‘will get better,’ as do another 43 percent who expect the status quo to remain. Sales volumes ‘will get worse,’ the remainder believes. INVESTMENT A majority (48%) of those consulted by the pollsters opine that the current investment climate is ‘fair.’ Conversely, only 26 percent of businesspeople view prevailing investment conditions in a positive light, and almost as many give the country’s funding prospects the thumbs down. “With the upcoming investment projects, things look to be picking up… There seems to be more optimism now, with more foreign funds coming into the country,” remarks a businessperson. SENSITIVITIES Commodity prices and the job market, as well as the value of the rupee, are additional issues highlighted by businesspeople, in terms of what the Government needs to focus on, to put the economy back on track. PROJECTIONS It is worth reiterating that the latest BCI records the sentiment gauged in the first seven days of September, so it does not reflect the VAT amendments announced a week later. This new tax burden – along with the prospect of Budget 2017 looming on the horizon, which could mean ‘more of the same’ – is likely to have an impact on business confidence, going forward. It goes without saying that the BCI outlook seems to be downbeat, although it could well be that the hype created by Sri Lanka’s upbeat development agenda may fill any void in business sentiment.